Associate Professor Lephoto started her career as a lecturer in Finance and Materials Management in the then Lesotho Institute of Public Administration which is today LIPAM from 1978 to 1983. She joined NUL in 1983 as a lecturer in the then Business Training Center of IEMS whose main responsibility was to train business people. She has academically grown within IEMS moving from noncredit programmes of entrepreneurship to credit programmes of business studies and adult education. She has been a programme coordinator, a head of department, a deputy director and a Director of IEMS. 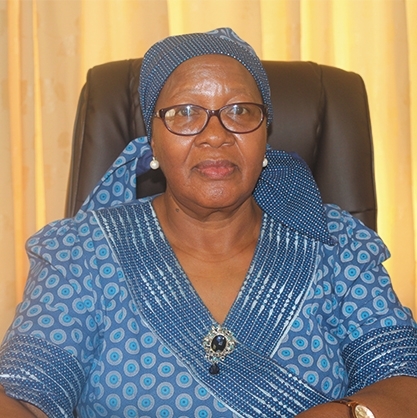 She is now the Pro-Vice-Chancellor for the National University of Lesotho. During her term at IEMS, the Institute has grown in terms of enrolment, in terms of numbers and levels of programme offering. Today the Institute is transforming from a purely part time mode into an open and distance learning mode ‚ in order to respond to the current need to open more access to NUL programmes to more Basotho who are not able to attend full time. Prof. Lephoto is very passionate about the ODL delivery mode and sees it as a great opportunity to bring University education to the educationally disadvantaged nationals and also to respond to capacity building for the working population. Her other areas of interest include community development, gender, adult education and leadership. The Pro-Vice Chancellor is University’s Academic Head who reports to the Vice-Chancellor and assumes the Vice-Chancellor‚s responsibilities in his absence. The Office of the Pro-Vice Chancellor is charged with helping University achieve excellence across all areas of the academic enterprise through oversight of undergraduate teaching and learning; graduate mentoring; faculty development, and the development of innovative academic initiatives. The office is responsible for the administration, coordination, and development of general policies and functions applicable to all academic programmes. Other responsibilities of the office include: overseeing the development of academic strategic plans across academic units; ensuring continuing professional development of the academic teaching and research staff through professional development opportunities both on and off campus as well as designing strategies and mechanisms to create a research culture, providing strategic direction to institutional research initiatives. The services rendered by the Pro-Vice-Chancellor’s office include chairing various academic and institutional committees as well as selection panels. The committees for which the Pro-Vice-Chancellor’s office provides chairmanship include the Academic Planning Committee, Space Allocation and Vacation Courses Committee, Library Board, Computer Steering Committee, Academic Planning Committee, Localization and Training Board, Sabbatical and Study Leave Committee, Monitoring and Evaluation Committee, Bookshop Committee, and Research and Conferences Committee. NUL's vision is to be a vibrant African University, nurturing thought leaders. P.O Roma 180, Maseru, Lesotho.